A new figurine arrived in my succulent garden this past Saturday, which happened to be not only the last day of 2011, but it also happened to be the sixth day of Christmas, when one's true love gives to them, "six geese a layin' . 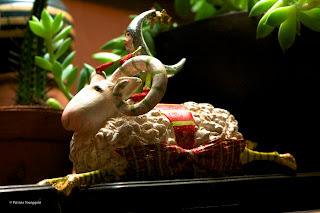 . . ", and I was given one sheep a layin' . . ; as seen here in the image above today's blog entry. Today, when I asked him if he'd like to say a few words about his arrival to my succulent garden, his reply was, "If it's Tuesday, it must be tumblr, and I'm feelin' shy and I'd rather slumber . . . "
Maybe I have a wolf in sheep's clothing? In any event, he's right, it is Tuesday, so it must be tumblr, and here's the link to take you there and I'll see you tomorrow.